Love Hamsa Pendant . Pendant measurements are 3/4" X 1/2". The hamsa, also romanized khamsa or chamsa, is a palm-shaped amulet popular often incorporated in jewelry as a defense against the evil eye. The Hamsa is popular particularly among the Sephardic Jewish community. The Hamsa hand represents the five books of the Torah for Jews. It also symbolizes the fifth letter of the Hebrew alphabet, "Heh", which represents one of God's holy names. Many Jews believe that the five fingers of the hamsa hand remind its wearer to use their five senses to praise God. 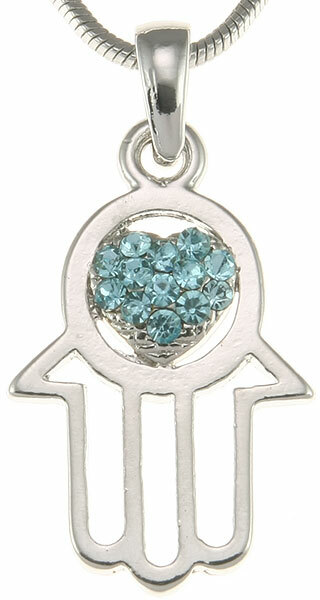 The Hamsa Hand is popular as a charm most often worn as a necklace. The renewed interest in Kabbalah and mystical Judaism is a factor in bringing the Hamsa hand pendant back in fashion. In Judaism, Hamsa Hands and Fishes represent luck and fertility. Naomi Jewelry is proud to have such a meaningful pendant in stock.